Guitar effects pedals come in many different shapes and flavors. From simple tuners to complex flangers, guitar effects pedals are the ultimate tool modern guitar players use to shape their tone. 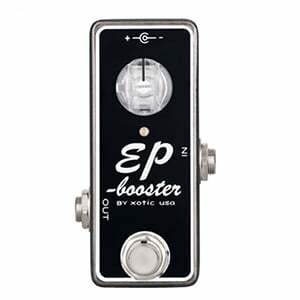 With that said, one of the most overlooked guitar effect pedals have got to be the boosters. One of the reasons for this is the fact that not a lot of guitar players even truly understand what boost pedals are used for, or what kind of effect they can have on the tone of a guitar. Today we are going to try and answer these questions in a thorough way. Hopefully by the time you are done reading this article, you will know everything you need to know about boost pedals and their use. How Does a Boost Pedal Work? Boost pedals are inherently among the most basic effects pedals there are. The whole idea behind a boost pedal is to add more gain to your guitar’s signal before it hits the input stage on your amp. However, it does this without adding distortion to the signal or making any EQ adjustments. The output from the boost pedal is clean. In most cases, this type of effect is going to be transparent. This means that aside from not distorting the signal, a booster will also preserve the timbre of your guitar in its original form. Even though all boosters are generally put in the same category of effects, there are some different types you should be aware of. We will cover the three most common ones, although you will probably find a few more if you dig deep enough into the subject. These three types of boosts are what most of the currently popular boost pedals can be defined as. Clean boost is what most people think of when they talk about boost effect pedals. For the most part, clean boost pedals will increase the volume of your guitar while leaving the EQ of the signal the way it was originally set. That is partially what having transparency means. Clean boosters are great for a number of different applications, which you can read about in our dedicated piece that goes deeper into this subject. ‘How To Use a Boost Pedal’. Most guitar players will have a clean boost of some kind on their pedalboard simply because how versatile this effect is. Treble boost pedals are similar to clean boosters in the sense that they add more gain to the signal. However, most of that gain goes to the higher frequencies, while leaving the low ones unchanged for the most part. Treble boosters are not that transparent, and add a bit of their own flavor to the signal. One good way to use treble boosters is for solos where you want the high tones to crack up when you hit the boost. Some guitar players don’t consider a treble boost to be a true type of boost, but that is up for discussion. Aside from these two well-defined categories of boost pedals, there are a lot of various hybrids on the market. We are talking boost/overdrive pedals, pedals that have an EQ cluster and so on. These are not necessarily bad purely from a booster standpoint. Some of them have quite a transparent nature, which is exactly what you would want to find in this type of pedal. Boost pedals with an EQ are interesting, to say the least. They usually allow you to increase the gain on the treble and bass portions of the signal, up to 20 dB in some cases. If you’re wondering what good is a low-end boost, just think of what it can do for a Stratocaster or any other guitar that packs single coils. You can fatten the sound of those guitars quite a bit, making them more versatile. Boost pedals are simple and valuable pieces of gear that any guitar player can benefit from. With that said, creating a transparent boost pedal that is also packing enough heat is anything but easy. We discussed different types of boosts available, but it should be noted that clean boost is what people usually mean when they talk about these effect pedals. However, that doesn’t mean that other types of boost pedals are not practical. The only thing you need to know is that hybrids and treble boost pedals generally aren’t as transparent as clean boost ones. Sometimes this can be a good thing, depending on what type of application you have in mind. If you are just starting to get familiar with boost pedals, we recommend you begin with a solid clean boost that is not riddled with bells and whistles. This type of boost pedal will give you the most authentic core experience. Once you figure out whether or not that works for you, you can start exploring different types of boosts that might be more up your alley.